Police Gazettes are a unique, useful and extremely fascinating resource for local, family and social historians and researchers in other fields throughout Australia. They contain a wealth of information for anyone with interests in someone who was in the Victorian Police Force as well as the people police dealt with. You may find your ancestor among those on the wrong side of the law, or perhaps as a victim of a robbery or assault, missing person or a witness to an event. Details can all be found in the police gazettes. Compiled to be distributed amongst the Police Force only, the Police Gazettes contain fascinating details and information that cannot be found anywhere else. The information contained the Police Gazettes does vary a little from year to year, but overall each issue is usually eight pages, and contains information on changes within the police force such as promotions, demotions, resignations, dismissals, deaths etc. They also include details about court lists, warrants, rewards, housebreak-ins, robberies, arson, murders, inquests, lost horses and cattle, deserters, escaped prisoners, missing friends, lost, found and stolen items, reports on those apprehended and discharged, and so much more. Notices from interstate police gazettes are often included. 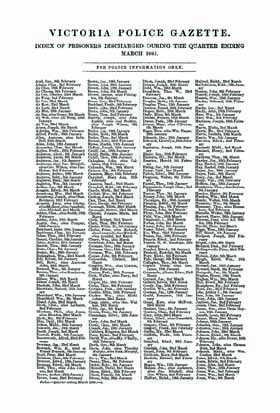 The 1891 volume features lists of auctioneer licence holders. Minnie White is charged, on warrant, with abandoning a female child under 2 years of age, with Sarah Ann Baron, 47 Victoria-street, Fitzroy, at Fitzroy, on the 6th February last. Description: - Victorian, 25 years of age, 5 feet 5 or 6 inches high, slender build, dark complexion, dark hair, frizzy in front, very much freckled, very white teeth. Is known as Caroline Bray. - O.5655. 13th July, 1897.